Westbury-on-Trym CofE Academy (WoT) in Bristol has had a link with Shree Himalaya, Singdi for nearly 20-years. This partnership has been very successful and provided significant benefits to both schools: raising awareness and a better understanding of different cultures, education systems, climates and traditions for staff, children and parents/carers within the two communities. Vital fundraising has also taken place over this time, to a total of about £26,000, which has enabled the development of vital new learning spaces in Singdi such as a library, computer suite, 6th form block and science laboratory. Computer equipment and library books have also been provided. 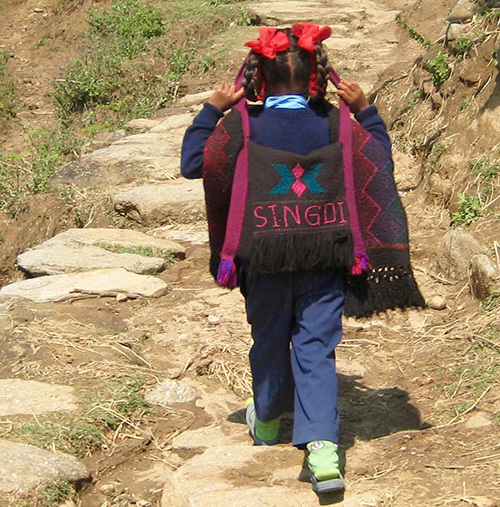 The link originally began in 1999 when Dr Tim Mitchell, PTN Trustee and parent of a child at WoT at the time, led a group of pupils and teachers to Nepal and visited Singdi Village. One of the pupils on that first trip is now at teacher at Bristol Free School (BFS). As a result of his own experiences and commitment, he has extended the partnership so that we now have a high-quality secondary school also working with WoT and Shree Himalaya, SIngdi. This important because Shree Himalaya educates children from 4-18 years old. The first primary and secondary combined pupils’ trip to Singdi took place in 2017 and a separate secondary school expedition of 6th form BFS students is scheduled to take place in July 2019. Ten years after the initial trip in 2009 a large group of 22; made up of staff, pupils (some as young as 9 years old), along with their parents travelled to Nepal for two weeks over the Easter holiday led by Anne Griffin.Knowing that the resources at the school were limited the group raised over £9,000 for the school before travelling. Once at Singdi, they discussed the best use of the funds and agreed to use these to build a new 2-room extension as a library and computer room. It was this meeting with Lusiri that inspired a group of Deaf friends and parents of Deaf children to begin fundraising to provide improved education facilities in Nepal and their efforts continue to this day. Members of the community at Elmfield Deaf school made a second separate trip to Nepal in2013, building further links with the deaf community which have continued regularly since that time. WoT school has continued to encourage parent-led trips to travel to Singdi with their children, with the support of the Pahar Trust Nepal. These have taken place in 2014, 2017 and another trip is also planned for 2019. A trip had been planned for April 2016 but when the terrible earthquake disaster hit Nepal in April 2015 parents felt it was not appropriate to impose on the community when so much restoration work and re-building work was ensuing.However, the community in WoT, supported also by student at St Bedes secondary School in Bristol, raised funds to help Singdi carry out vital repairs and re-building work to the whole of the first floor of the school, which had been badly damaged in the earthquake. As a result of re-scheduling the children’s trip, the Headteacher at WoT, Cathy Milton, accompanied by Dr Mitchell and his wife, who was a long-standing governor at WoT went themselves to Singdi inApril 2016. Cathy describes being very moved by this experience and the incredible difficulties that all those living in Nepal had endured since the earthquake had struck. She saw for herself the damage caused to Ghamrang, Pasgaun and Shree Himalaya schools as she visited them on her journey. She felt humbled by the very warm welcome she received in each school, but especially Singdi, and the kindness of everyone she met. Cathy took with her, two bags of uniform from WoT to give the children, along with other educational resources and a book made by children for their friends in Singdi. She was astonished to come across a little boy wearing a T-shirt that had been donated to the community as part of the 1999 trip some 17 years earlier! It had clearly been treasured and worn by several older members of the family previously. It was during this trip that Cathy heard about the difficulties that some rural school have keeping excellent teachers, due to funding shortages. This is true of Shree Himalaya school, and so in the year that followed this trip the WoT community agreed with Singdi village to co-fund the start-up costs of a sustainable new project. This was the development of a Cardamom plantation. Over time, the sales of the Cardamom grown could be put towards helping with the cost of the teachers and thus ensure high quality and committed teachers could both be attracted to and remain in the school. The programme of trips over the years has also enabled staff, children and parents from WoT to have first-hand experiences of ‘life in Nepal’, the incredible landscape and warm hospitality received everywhere they visit. With each trip, the group visiting has generously raised funds, with support from the wider WoT community to provide additional resources to Shree Himalaya school. In 2017-18 (along with support from Bristol Free School) around £7,000 was raised to provide a new Science Lab at the school. As part of the WoT 2019 trip, the group will be seeking to raise funds to provide an improved kitchen and dining area as the current facilities are very basic being a tin shack at the back of the school with a single stove. A new kitchen will enable the school to provide the students with a healthy and sustaining meal.